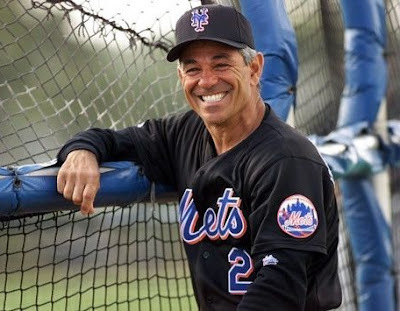 Nearly two months after parting ways with Terry Francona, the Boston Red Sox have hired Bobby Valentine as their new manager. Valentine spent parts of fifteen seasons with the Texas Rangers and New York Mets, but has not managed in the major leagues since 2002. He has worked for ESPN as an analyst the last two years. With the Mets, Valentine was 536-467 (.534) over seven seasons (1996-2002) and won the National League pennant back in 2000. During his eight-year tenure (1985-1992) with the Rangers, he was 581-605 (.480). The American League East will now feature a number of high-powered managers. Valentine joins New York's Joe Girardi, Tampa Bay's Joe Maddon, Baltimore's Buck Showalter and Toronto's John Farrell in the division. The Red Sox also interviewed Gene Lamont, Torey Lovullo, Dale Sveum, Sandy Alomar Jr. and Pete Mackanin for the position. Not exactly sure how I fel about this hire. He's been out of the "loop" for nearly a decade. He was a fairly good manager back in the day, so I guess we'll just have to wait and see. I think Valentine is actually a downgrade from Terry Francona, so I'm not really sure what Boston is thinking with this one.